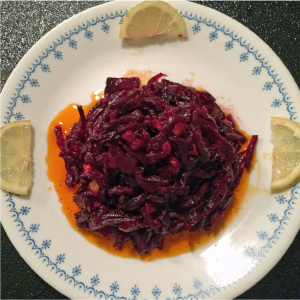 Here is a fun pickled beet recipe that I’ve paired with a spicy chicken. 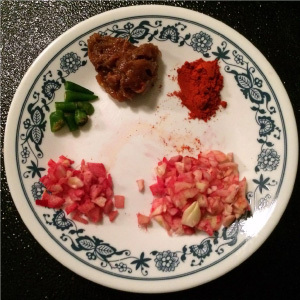 One of the easiest ways to make spices and herbs part of your diet and gain the nutrients contained in them without having to eat a large quantity of energy-containing foods is to consume pickles and chutneys with your meals. 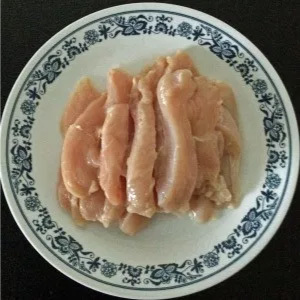 Slice chicken to ½” wide strips. Add all the ingredients listed above and marinate chicken pieces overnight. 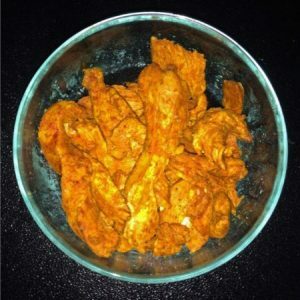 Bake the marinated chicken in a 350° F oven for 20 minutes. Stir the chicken strips in the juices and bake for another 20 minutes. Cut beets into very thin slices. Sauté the slices in oil, remove from the pan and keep it on the side. Add garlic, ginger and green chili to the oil in the pan and sauté. Add the cayenne pepper, tamarind, brown sugar, and salt to the pan, and put the beets back in. Mix and sauté another minute. Eat 2 to 3 teaspoonful mixed with squeeze of lemon. This will keep for at least 2 weeks when refrigerated. Ginger contains dietary mineral manganese. Chilies contain vitamins B and C and dietary minerals potassium, magnesium and iron. Tamarind contains B vitamins and calcium. * Tamarind paste is often used in Thai and Indian cuisines. You can purchase it in jars in many supermarkets, or make it yourself by taking 2 tamarind pods, soaking them in hot water for 2 minutes, and squeezing the pulp out of them. Be sure to remove the seeds and shell fragments from the pulp.